Set to open in DECEMBER 2018, The Grand Reserve at Paradisus Palma Real takes all-inclusive luxury to a new dimension. Its sophisticated, stylish and modern design is the perfect canvas for a truly unique and thoughtfully crafted vacation experience. Each suite is appointed with the space, comfort, technology and luxury amenities reminiscent of a private villa. Experience elevated culinary experiences with the The Infinite All-Inclusive concept. 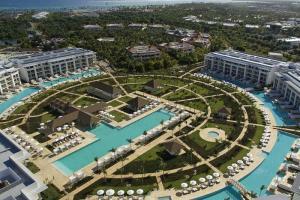 The Reserve features three exclusive pools, a spa, as well as an aqua park, beach club, kids club and a fitness center. Punta Cana International Airport is 15 miles away from the hotel.